Now anyone can build their own hunting blind for a fraction of the cost of prefabricated blinds. Our new EZ Tower Deer Blind Kit simplifies blind & tower construction, takes the guesswork out of leg angles and provides a rock solid connection between the deer blind and the tower. The unique modular design of our hunting blinds enables it to be disassembled into separate sections in minutes. Instead of strapping a huge, heavy tower blind onto a heavy flatbed trailer, simply load the lightweight sections into the bed of your pickup and go! Reassembly at your hunting site is quick and easy! The all-welded, heavy duty steel bracket construction ensures safety and reliability. 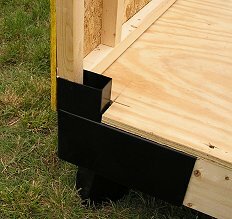 The leg posts and framing lumber simply slide into the custom sleeves on the brackets and bolt in place. The EZ Deer Blind Kit includes four steel corner brackets (above) a 10 page set of easy-to-follow building instructions complete with color images and photos, and a detailed materials list for the lumber and hardware. The initial construction of the basic blind can be completed in your garage or driveway in half a day, then quickly disassembled for easy hauling. Only basic carpentry skills and framing tools are needed. By making some simple dimension adjustments to the plans, you can build a 4×8′ deer tower blind for about the same price as a 4×6′. 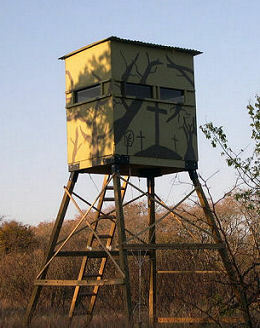 Build a 4×4′ deer tower blind for even less! The tower height for your blind will be determined by the length of the leg posts you choose. 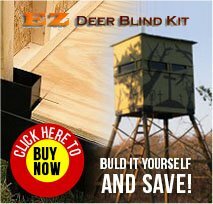 The EZ Deer Blind Kit now makes quality deer hunting tower blinds affordable for everyone! 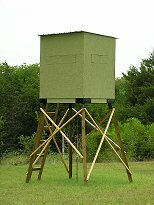 The 4’× 6′ deer hunting tower blind (pictured left) can be built complete for around $700! This estimate includes the price of the EZ Deer Blind Kit ($289) and all necessary lumber, hardware and paint (purchased separately). Now you may also elect to take the no payment and 0 interest option if paid within 6 months! We invite you to shop and compare. 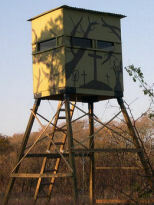 If you can find a better quality deer hunting tower blind for less, buy it! Also, check out our Deer Hunting Leases! AUSTIN – South Texas dove hunters will see increased opportunity this year thanks to a season framework adjustment expanding the early September 4-day Special White-winged Dove Area hunting season to the entire South Zone boundary. The change is part of the 2017-18 migratory game bird seasons adopted by the Texas Parks and Wildlife Department. 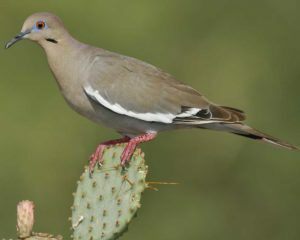 “For the second straight year, Texas will be taking advantage of a 90-day dove season and the expansion of early white-winged dove hunting during the first two weekends in September, in effect, create early September hunting opportunities statewide for the first time ever,” said Dave Morrison, TPWD Wildlife Division deputy director.